The Christmas Fair coincides with the switching on of the Christmas lights in Tarbert. The day starts at 4pm when the fair opens in the Tarbert Arts and Leisure Centre, there will be around 15 stalls offering many local crafts, treats and preserves which will allow you plenty of time to browse and buy that original Christmas present or stocking filler. Santa will be there too, from 5 to 6pm and again from 7 to 8pm so bring your kids along early to avoid disappointment. 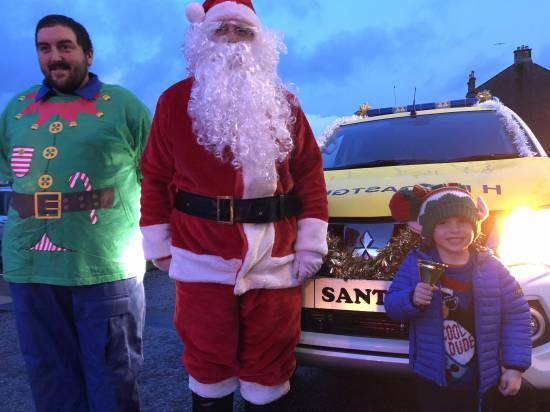 There will be a childrens parade from the Coastguard Station to the Tree where the Christmas lights will be switched on at 6.30pm this year by our Seafood Festival Queen. Come and join us for some community carol singing around the tree. Throughout the evening there will no doubt be mulled wine, mince pies and soup and the music will not be far away. This is a great opportunity to get the family into the festive mood to start the revelries with family and friends alike.